Not all applications for bridge cranes require one of our custom engineered solutions. We are proud to be a distributor of Gorbel enclosed track workstation cranes and monorail systems. These overhead crane systems utilize an enclosed track that is both strong and lightweight. Free-standing floor-supported systems allow not only freedom from the building structure, but also the ability to easily relocate the crane system when necessary. They require at least 6 inches of reinforced concrete flooring to support the structure. They feature up to a 34 ft. bridge and up to 124′ runway, though standard sizes range from 15-18 ft. wide and up to 23′ in length. 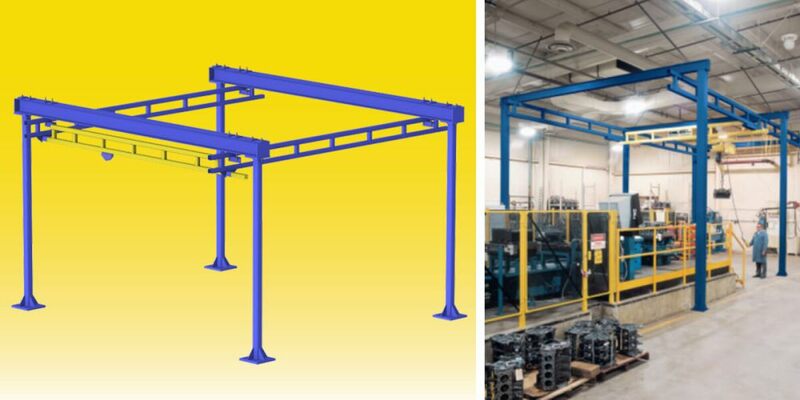 Featuring the same capacities as its free-standing counterpart, ceiling mounted bridge cranes require adequate overhead structure to support the crane plus its load. There are no support structures to obstruct work areas. This type of workstation crane has the same capacity range as the other options. It offers only linear movement, but it can be integrated with other systems.